I planned out this simple milk jug craft for my toddler the other day and it was perfect for her total can’t sleep won’t sleep mood this afternoon she was so tired but so in denial about it that this was the only way to get her out of a mood! 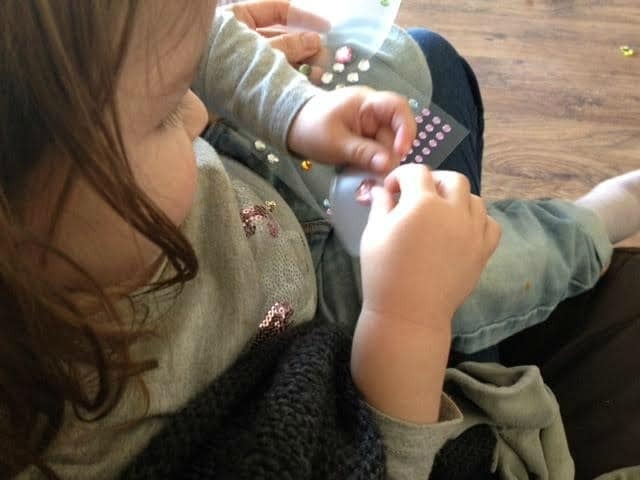 Of course while these eggs looks like a really simple craft (and yay, it is) there’s actually loads of little ways that you are sneaking learning in for your kid. Plus it’s fun to get the little one’s excited about Easter and crafts which involve raiding the recycling bin are always popular with me, I love a cheap way to keep my kids entertained! Use your scissors to cut egg shapes out of your milk carton, I find it easiest if I cut the flat sides out of the milk carton first and then attempt the shapes. 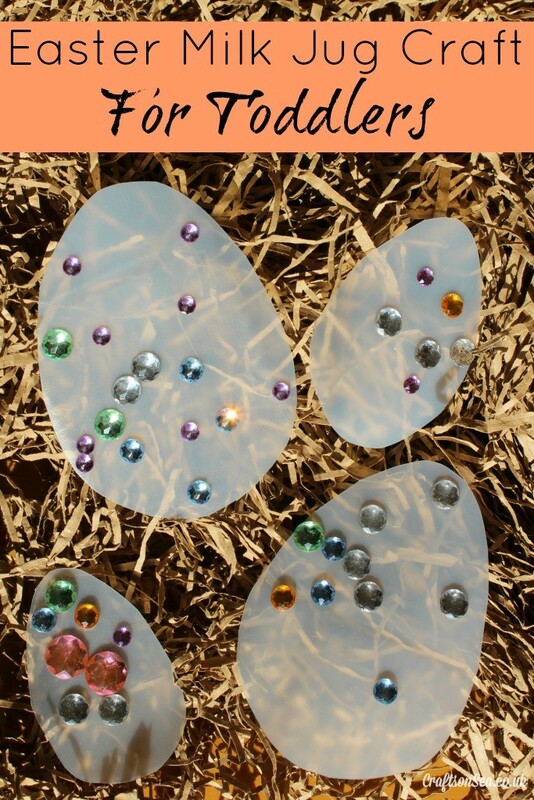 Give the egg shapes and the stickers to your toddler and let them get decorating. This is obviously super simple both to set up and make but you can talk about colours, sizes (which egg is the biggest), it helps promote fine motor skills and most importantly it was fun and it kept my toddler happy. I normally try to get a picture of my kids crafting so you know it’s not just me acting like a three year old or something, but today she would not budge from my lap! I managed to grab all of one (slightly blurry) picture and I think I’ve managed to hide most of the zillion toys that were on my floor?? Either way, it was nice to make these together and she loved the sparkly stickers too. Love kids crafts? Follow my board on Pinterest for loads more fun ideas. We did that, and then there was a huuuuuge wind and umm…no igloo! It’s great to see that you can create such nice craft from milk cartons. Looks like a great craft for the kids over the Easter holidays. Wow I love these, they look really effective and I think i’ll get the children to make some for our Easter Tree. We need a proper Easter tree, we have a load of sticks at the moment! I love anything upcycled like this. I have a jar of milk bottle tops I’m collecting and waiting for inspiration on what to use them for. I’ve turned bottles into ghosts but not thought to do Eggs, they look great especially with the gems on them. Love you to join me for Trash 2 Treasure with this one. Thanks, we made milk bottle ghosts (and a milk bottle penguin!) too – lots of fun! What a simple, but stunning craft project. The eggs look fabulous. So beautiful and easy to make and I am sure it would keep little ones busy for ages too!